"The map is mapping us," says Martin Dodge, a senior lecturer in human geography at Manchester University. "I'm not paranoid, but I am quite suspicious and cynical about products that appear to be innocent and neutral, but that are actually vacuuming up all kinds of behavioural and attitudinal data." The fact that I claimed not to be paranoid has raised a couple of comments from my colleagues. "In Rob Kitchin and Martin Dodge's book Code/Space: Software and Everyday Life (2011), the authors demonstrate the importance of software for the functioning of the social world everywhere from the home to air travel. It would be remiss to think that higher education somehow sits outside these broader social developments. Kitchin and Dodge point out that even mundane technologies such as Microsoft Word or Adobe Photoshop come "loaded" with "algorithmic normalities" that "subtly ... direct users to certain solutions". Without thinking too hard, we can immediately see that PowerPoint's algorithmic normalities are likely to be providing us with subtle directions in how to lecture." I've just received the pageproofs for a paper, coauthored with Chris Perkins. Its due to be published in the autunm hopefully. Visual representations have often played a crucial role in imagining future urban forms. In the aftermath of the Second World War, a noteworthy new genre of urban plan was published in Britain, most deploying seductively optimistic illustrations of ways forward not only for the reconstruction of bomb-damaged towns and cities but also for places left largely undamaged. This paper assesses the contribution of visual elements in this process with a detailed case study of the maps, statistical charts, architectural drawings and photographs enrolled into the 1945 City of Manchester Plan. The cultural production of these visual representations is evaluated. Our analysis interprets the form, symbology and active work of different imagery in the process of reimagining Manchester, but also assesses the role of these images as markers of a particular moment in the cultural economy of the city. This analysis is carried out in relation to the ethos of the Plan as a whole. 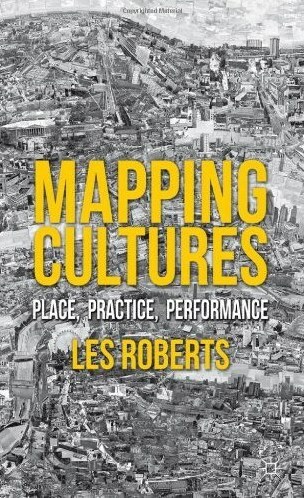 Our chapter on Manchester as a 'hydraulic city' read through original maps and plans of water supplies and sewage systems has been published in a new edited book Mapping Cultures: Place, Practice, Performance (Palgrave). 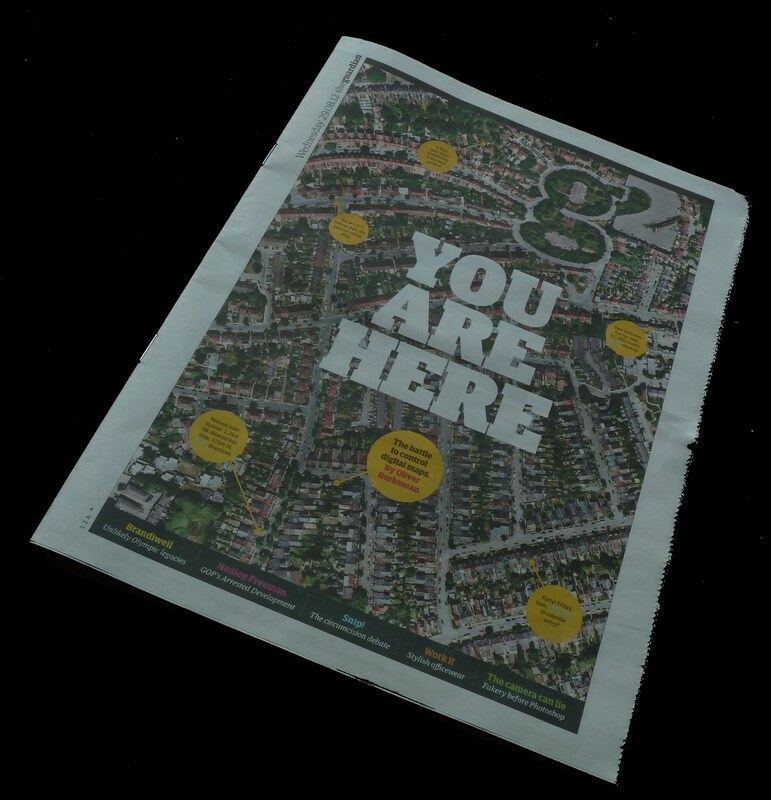 The book is a useful collection of pieces relating to spatial representation and aspects of urbanity, expertly pulled together by Les Roberts. 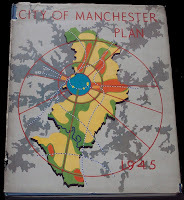 You can read an uncorrected pageproof version of the chapter, 'Maps, Memories and Manchester: The Cartographic Imagination of the Hidden Networks of the Hydraulic City'. 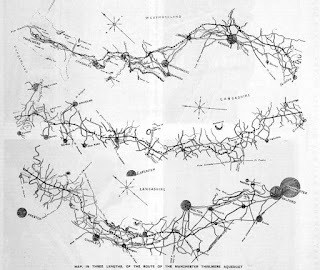 Below is an example of the kinds of historical mapping we analyse, in this case a simple segmented chart of the Thirlmere aqueduct, a triumph of Victorian engineering that brings fresh water from the Lake District down to Manchester. (Source: The Engineer, 19th October 1894, page 340.